Gilder Lehrman Collection #: GLC07733.01 Author/Creator: Roosevelt, Theodore (1858-1919) Place Written: White Nile River, Sudan Type: Autograph letter signed Date: 10 March 1910 Pagination: 2 p. ; 28 x 22.8 cm. 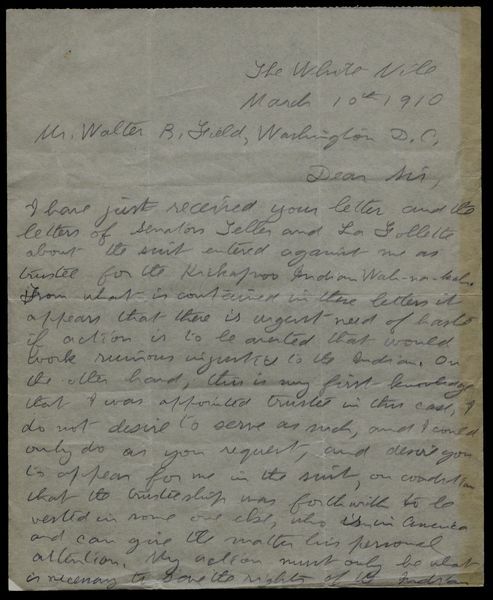 Summary of Content: Roosevelt discusses a suit in Oklahoma against him "as trustee for the Kickapoo Indian Wah-nah-ka" and how to proceed so that the Indian's rights were protected. Wants Field, a Washington Attorney, to appear on his behalf. Also indicates that he wants a new trustee appointed, because he was in Africa. The letter was written from the White Nile River.